An international expedition to a remote Galapagos Island rescued enough tortoises to start a breeding program that may help resurrect an extinct species, investigators from Yale University report Sept. 13 in the journal Science Reports. However, the search for genetic relatives of Lonesome George, the last tortoise of its species which died in 2012, came up empty. Many members of the two species of tortoises — marked by the distinctive saddleback shape of their shells — were removed from their native islands of Floreana and Pinta more than two centuries ago by sailors looking for food. However, researchers in 2008 found tortoises with the distinctive saddleback shells on Isabela Island in the Galapagos where native species have dome-shaped shells. Subsequent DNA-based analyses showed these tortoises were descendants of species from Floreana and Pinta. Ancestors of these tortoises were probably thrown overboard by mariners who did not have space for them on ship, and then over generations they mated with native species. 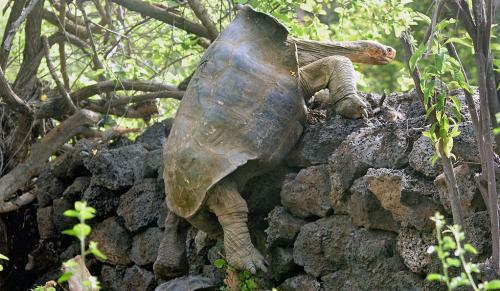 Tortoises have been extinct on Floreana for the past 150 years and Lonesome George was last tortoise alive on Pinta. This discovery prompted the Galapagos National Park, together with the Galapagos Conservancy, to sponsor an expedition in 2015 to look for genetic relatives of the extinct species of tortoises and to launch a breeding program aimed at restoring them to their native islands. “The irony is that these species have a second chance for same reason that they died out — their handling by mariners some 200 years ago,’’ said Yale’s Adalgisa “Gisella” Caccone, senior author of the paper. The expedition found and removed for breeding 32 animals with relatively large percentages of their genome from the extinct species from the Floreana island but found no descendants from the species from Pinta, the home of Lonesome George. The investigators had previously estimated that there were about 60 genetic relatives of Pinta species living among 6,000 to 8,000 tortoises living on Isabela. “If we get funding, we will go back and look for tortoises from Pinta lineage as well, we knew that they were harder to find than the ones from the Floreana species’,” Caccone said. The goal under the Giant Tortoise Restoration Initiative of Galapagos Conservancy is to mate tortoises with high levels of DNA from extinct species, and reintroduce them on native Floreana and, perhaps one day, Pinta. It will take many generations to “bring back” the extinct species from Floreana and possibly we will never have pure Floreana tortoises again, Caccone cautioned. “Of course, it is easier and faster to destroy than to restore,” she said. The researchers are now working together with the Galápagos National Park and the Galápagos Conservancy on plans to develop a monitored breeding program with the animals retrieved from V. Wolf. This program will strive to preserve in future generations the diversity of the breeders and to maximize the Floreana species’ genomic representation in their offspring. The current plan is to release young tortoises on the island within five years, to jump-start the recovery of the island’s ecosystem which critically depends on its tortoises. Major funding for the expedition was provided by the Galapagos National Park, Galapagos Conservancy, and National Geographic Society. The genetic analyses were supported by contributions from the Mohamed bin Zayed Species Conservation Fund, Galápagos Conservancy, the Oak Foundation, and Turtles Conservancy. Yale’s Maud Quinzin and Joshua Miller are co-lead authors of the paper. Researchers from several countries besides the US, including Australia, Belgium, Ecuador, Greece, and Italy were also involved in the study.